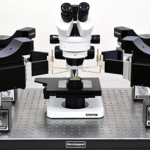 New updates are available for your Micro Support Micro Manipulator. Updates are for all systems including Axis Pro F, FC and SS. The higher resolution camera will allow for magnifications above 3200X. The new camera will improve the image clarity at all magnifications. More tools will now be operated from the mouse allowing for easy control in difficult environments. 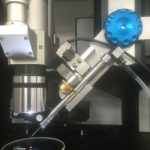 Can rotate probes remotely making it easier to pickup and drop off samples. The new software operates under Windows 10. It includes many enhancements to make operation better. The Navigation Map is now extended to allow for tiling a 10 x 10 set of images to provide a larger area for visual imaging. The whole UI has been redesigned to improve the experience. This includes placing your working image in the center of the screen and moving menus to the sides. Quick Pro has now been updated to include the AxisPro controller, manipulator, and will now have a tablet interface.